Pittsburgh Penguins rookie forward Daniel Sprong is dealing with a visa issue and will miss Tuesday's tilt with the Florida Panthers. Pittsburgh Penguins rookie forward Daniel Sprong will sit out Tuesday’s game against the Florida Panthers with a visa issue, the team announced. 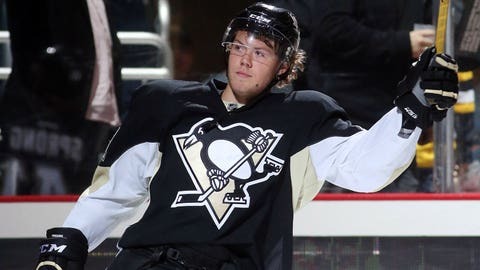 Sprong, who grew up in a Montreal suburb after being born in Amsterdam, Netherlands, had his initial appointment to extend his visa delayed on Monday. "The process is happening right now," coach Mike Johnston told the Pittsburgh Tribune-Review. "Because of the delay of the first meeting, he will be out for tonight because he won’t be able to be back in time if it does move along." Bobby Farnham is expected to play in place of the 18-year-old Sprong, who became the second Dutch-born player in the NHL to score a goal when he tallied in a 2-0 win over the Ottawa Senators on Thursday. A second-round pick of the 2015 draft, Sprong has nine games to impress before Pittsburgh can decide whether to send him back to juniors or keep him in the Steel City.